In this reflection I talk about the value of the class party. Some look down on the fun classroom gathering as a waste of time that should be spent with curriculum. I share my thoughts on how it is important to create and nurture a positive classroom environment for our students and a party the day before break is a great way to do that. What do you think? Here it is! Starts at 8:30PM EST! As an English teacher, many people assume that I am a voracious reader. I am in spurts. I will dive into a bunch of books and mass consume story after story, then take a break. I find it hard to start a new book after I've read a great one because I don't want stories to end. I'm always happy when I've read a great story, but very sad that they had to end. I love recommending books to friends, but it is something that doesn't happen very much anymore. I've thought about this from time to time, but didn't think there was really anything to do. Well, Kid President has come up with something awesome. It is such a simple idea. Share your books. 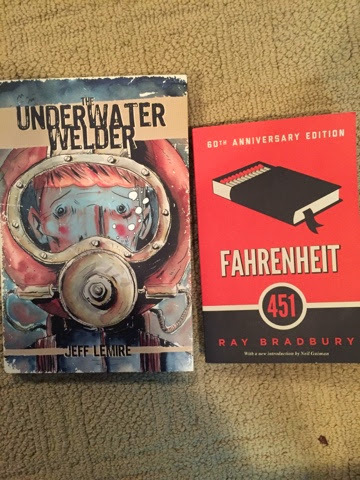 Share those books that mean something to you with anyone. They can be friends or complete strangers. It is never a bad thing to pass something on to someone else if it has meaning to you. It's like passing on a warm hug to someone who might need it. I have decided to pass on this book to my friend Tina P who lives in the great country of Australia. In support of #BookItForward by @iamkidpresident, I will send one of my favorite books to you. Who wants it? I just love the book Blankets by Craig Thompson. It's an awesome coming of age story that is beautifully written and drawn. It covers young love, families, being different, and more. I think there is something in Blankets for everyone. It's just a darn good book. 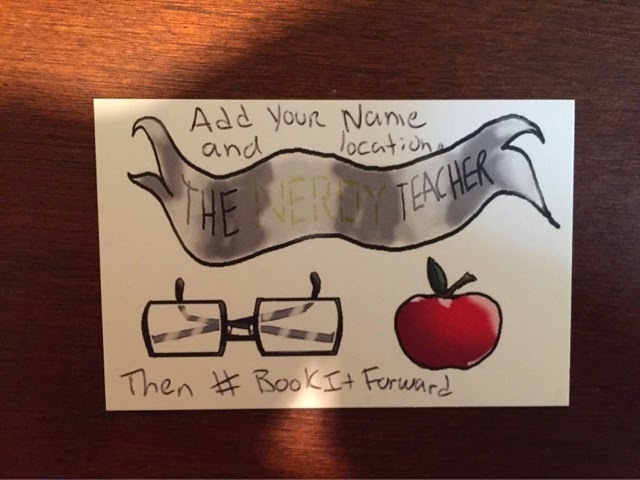 I would love to see the educational community get behind this awesome idea and #BookItForward with other teachers, students, parents, and/or anyone in your life that needs a good book. Please take a moment to #BookItForward and use that hash tag when you share the awesomeness on Twitter and Instagram. Thanks everyone! Let's do this! I've sent 3 book out today. 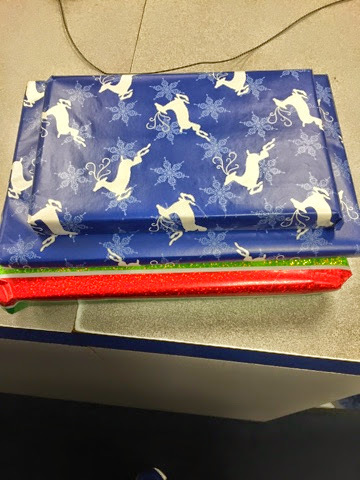 1 to Ed in Michigan, 1 to Chris in Ontario and 1 to Tina in Australia! I'm so excited to see what happens next. I signed each book and left a note asking them to sign, add their location, and then #BookItForward. I hope you take up the challenge! 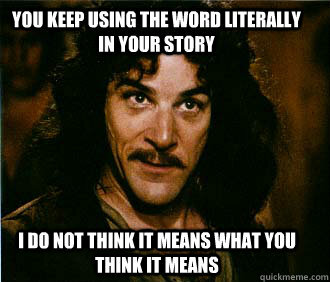 I'm looking at you #TLChat peeps. This session will provide first an overview of the rubrics generator within Bb and how important the process is for students to have a clear understanding of the expectations. This allows them to self-assess first, then rewrite/edit their own work before submission. These rubrics can be general applying to all written work or made more specific for Discussions, Blogs, Wikis, Journals, uploaded documents, or web based presentations. 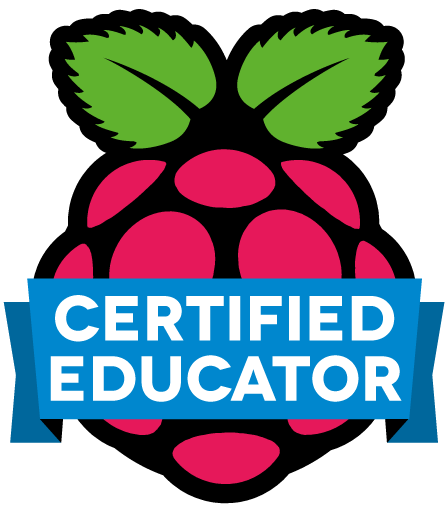 The process of discovering an online rubric that meets most of the instructors needs, the using that content to create a Bb rubric will be demonstrated. 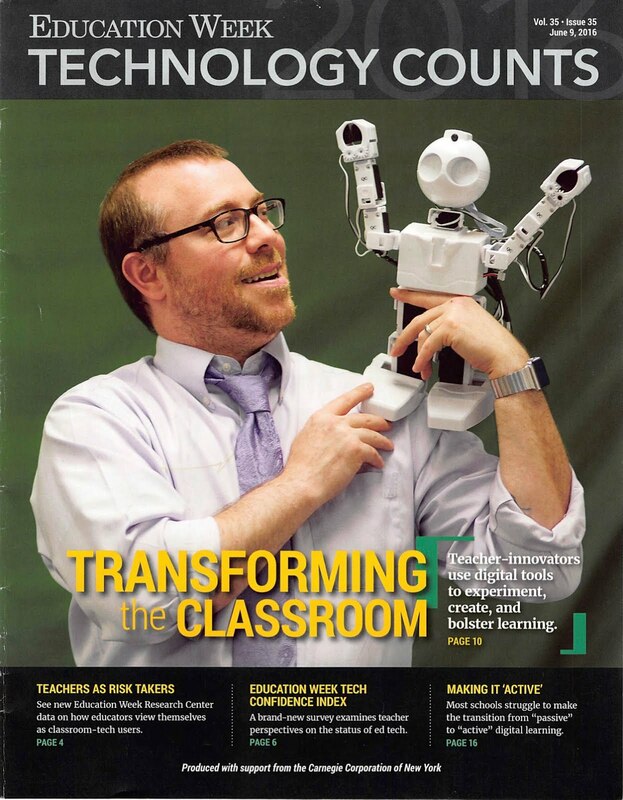 Larry Fallon is the Instructional Technology Coordinator for Arlington Public Schools in Virginia. He has been and ITC for APS since 2000. 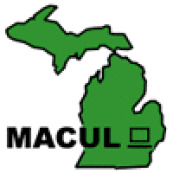 In that role he develops PD opportunities for the teaching staff at multiple sites and help implement those with students by modeling in classrooms and then, as a teaching aide, allowing the classroom teacher to manage the activities with my support. He also coordinates the phased replacement of old technology with new devices. Prior to joining the APS district he was the Director of Information Technology for Johns Hopkins University at the Rockville MD and Dupont Circle, Washington D.C. campuses. His classroom experience was at Sandy Spring Friends School in Olney MD. It has been a productive couple of weeks with my students. My kids are working very hard on their 20 Time projects, but they are also working very hard on learning about literature and how it relates to their life. We have had some great conversations in my classes. Freshmen and Sophomores have been amazing. I'm working on a Makerspace in my school and I'm shooting for highly effective for my evaluation this year. I've asked to be back on cycle and feel confident I can do this. Reflection is one of the tenants of HE, so I've got that down. 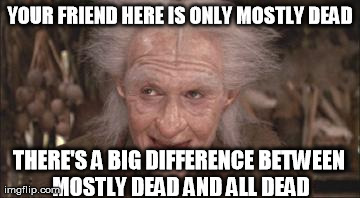 Here are my thoughts on the past couple of weeks. Share any thoughts in the comments sections. Thanks! This presentation will explore the myriad of myths surrounding online and blended learning and will shatter the long established yet incorrect myths that seem to orbit online and blended learning. Despite the infancy of online and blended learning, there is a need for high quality online and blended learning educators and leaders. Participants will engage in conversation around these myths, and the implication each holds for learning, and will discover and share promising online and blended practices to help support the teacher and leader in navigating both online and blended environments. environment. Don Lourcey is the Director of Professional Learning for North Carolina Virtual Public School. He has been an educator for 22 years and before coming to NCVPS in 2007, he served as an English teacher for 11 years and an Instructional Facilitator for 4 years. 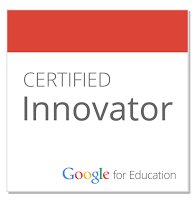 He is passionate about teaching, learning, innovation, leadership, and digital literacy. He currently lives in Statesville, NC with his wife Michelle (the Chief Academic Officer for NCVPS) and his daughter Elizabeth, and two cats, Gator and Tebow (yep, you guessed it, he is a Florida Gator fan). It has been a long time since I have done one of these posts. Almost two years to be exact. Sometimes we let life get too busy and you forget to go back to your roots and do the things that make you smile. Check out some of those old posts if you have a minute. They all still ring very true for me. One day I will drop all of those crazy thoughts into a book. 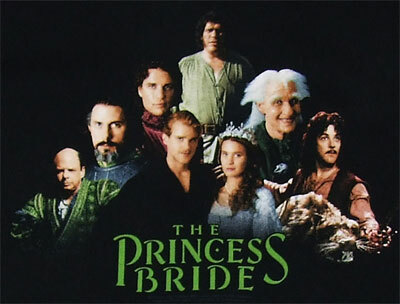 Until then, enjoy Everything I Learned About Education, I learned from Watching The Princess Bride. One of the things I've noticed is that some people think that teaching in a class with 1:1 devices makes teaching so easy. In reality, teaching with devices in the classroom makes life a bit tougher for a teacher. Only after a couple of years of having the devices did I feel like my lessons were fully taking advantage of the technology in my classroom. Every new lesson I want to create needs to take the devices into consideration. I'm constantly rethinking my approach to topics and curriculum because the devices offer more possibilities. I know I am very lucky to have the devices for my students to use, but it does take hard work to plan around the devices so students are using them for more than just expensive notebooks. Like all lesson, planning around tech takes time and is never as easy as it looks. I think it is important to remember that when we see what others are doing in the classroom. Teachers need to stop pretending to know everything. Saying IDK has been one of the most freeing things I've done in my years as an educator. Now, there are some things I should know and be able to answer in my classroom, but sometimes students try their hardest to stump me. I used to drone on about what a good question it was and then throw it back at them to see what they thought without ever really answering the question. Now, I can say that I don't know and we can look for an answer together. I've found that students are more comfortable saying they don't know something after I have said it in class. The most important part of saying IDK is saying that we should find the answer. IDK is not the end of the issue it is the beginning. We have the resources to find the answer. I've had students take out their phone and find the answer. If the student really wants to know something and I don't know it, I'll let him search it and report back to class. If it is a tad off topic, I'll tell him to search it and get back to me at the end of class. Teachers shouldn't dismiss inquisitive students and they shouldn't claim to know all the answers. Kids have a great BS detector. Being honest in not knowing something will create an environment where students will also feel comfortable not knowing and asking for help. This is the toughest part of the job, but it is so important. Student feedback allows teachers to change what needs to be changed and focus on areas student want extra help. We are always afraid of negative feedback, but there is always some truth to those comments. Google Forms are great for letting students provide feedback at the end of a unit of a semester. TodaysMeet is perfect for an exit ticket system to see what students know at the end of a class period. Using the feedback is the next step. It's great that you listened to your students, but what are you going to do about it? I've made changes on the fly based on student feedback and I let the kids know it was because of their comments. The students loved that they felt some control over how lessons were being presented. I've tried things students have suggested and got feedback again. They said the other why was better. Feedback is important and implementing it can really bring a class together. We live in a world where everything is now now now. Teachers see a new tool, try to use it right away, and are annoyed when things did not got as planned. Any lesson created needs time to mature. For some reason, people think tech integration is different. Imagine all of the great lessons that would be lost if they were tossed after the first try because they were not perfect. Each lesson is designed to engage and inspire students. That is a miracle. Crafting great lessons takes time and all educators need to understand this aspect of teaching. Using ready made lessons out of the box is going to get the job done, but will it be a good job? Teachers need to be given time to connect with other educators and craft the wonderful lessons that will make a difference in the lives of the students that sit in front of them every day. These lessons are not hastily thrown together. They need time to grow and become the lessons that will have the biggest impact. Let's all remember to take our time and allow our lessons to mature at their own pace so they can be little miracles for our students. There are so many buzz words in education that I have a hard time keeping track of them all. You are flipping over PBL or UDL or just keeping your head down and focusing on CCSS so students can be CCR. All of these terms are pretty much worthless. I have found that the brand new craze has been around before and it will come around again. There are also many different meaning to these words and people argue over the exact meaning from time to time. Is it "Problem Based" or "Project Based"? Does it matter? Let the mouths keep mouthing and the teachers keep teaching. We know what is best for the students that are in front of us. That should always be the number one focus. I know that I'm a big advocate for 20 Time in the classroom. Others call in inquiry based learning. Others call it Genius Hour. Instead of arguing over what to call something, let's focus on whether it works for the students. Frankly, the students do not give a crap what it is called when they are engaged. Those terms are for people obsessed with labeling things. A year ago, I had no idea what UDL was. I googled it and I realized very quickly that I have been doing it in my class for years. I'm actually a bit of a pro at UDL when I sit and think about it. I had no idea. As long as teachers focus on sound instruction, the labels will come and go and the students will always be prepared. Do not fret the new acronym. Just roll with it and be awesome in your class. I really wanted to end with this one. I think it is important to remember that we need to serve our students. I'm not sure how some are going to take this statement, but I believe it to be true. Some students are more needy than others, so it can be exhausting to be serving them more that others, but that is our job. It is not easy. If you wanted an easy job, you made the wrong life choice. We all have our good days and our bad days, but we need to remember that we are there to support our students in their learning. We can teach them to be independent and we can teach them to pursue their passions, but we cannot expect them to get their on their own. We have been tasked to do the most important, and most difficult, thing in the world. We can inspire the next generation by meeting their needs. Those needs will continue to change and the rules of how we have to meet those needs will change, but we need to do it. Who will if we do not? Congress? There were many more quote that I could have used for this post, but these were the best for the education topic. Thanks for reading. If you want to share your favorite quote, feel free to do so in the comments section. I've had the opportunity to give some Bump Armor products a trial run and I have to say that I'm very happy with how they performed. The iPad case by Bump Armor is a solid case for those that have a case of the "dropsies" from time to time. Made from a non-toxic foam material, it passed a military grade drop test. Its ergonomic design lets the iPad and case sit comfortably in your hand. There is a Max version (Right) and a Light version (Left) that allows people to choose how much protection they will need for their device. I felt confident dropping my from desk level on to the hard floor in my class as a test. The case bounced and the iPad was just fine. If you need a case to protect your device from the bumps and bruises that seem to happen once in a while, this is a great case for you. It comes in multiple colors and an optional stand to purchase as well. Chromebook case was perfect for my Chromebook. I've been traveling much more with my Chromebook because I have fallen n love with it. I use it all the time when I travel now. I have always been worried about the safety of the Chromebook as I bounce from airport to airport and in and out of conference rooms. This very simple and strong case has kept my Chromebook safe. It even slipped out of my back I accidentally left open and hit the ground pretty hard. I was freaked out, but everything was just fine. I had not seen any Chromebook cases in the past, but I will not have to look for one again. This one is just perfect and fits most Chromebooks up to 14 inches. If you are looking to protect your Chormebook, check out the CB Slim Hardshell Chromebook Case. I've found my new Backpack. It is simple as that. I love this thing. It has storage for everything I need and everything fits nice and securely where I need it. The backpack offers five sided protection of the Chromebook and multiple pockets for all of the extra gadgets I need to carry with me as I travel from conference to conference. It even has a nice side mesh pocket for my water bottle. For me, that is a huge deal. The backpack sits comfortably on my back and is easy to adjust. It is water resistant, has a special smartphone pocket, and space for pens and pencils. It has everything I needed in a backpack. I couldn't be happier with this backpack and will not need a replacement for many years. You will see it with me at the next conference. Overall, all of these products are wonderfully made and perfect for the person looking for quality protection of their technology. Please check out their website, BumpArmor.com, to check out all of their products and see which ones might be a perfect holiday gift for a friend our yourself. Bump Armor sent me samples for the purpose of a review. The opinions expressed are my own. The Fujitsu ScanSnap SV600 is awesome. I just wanted to get that out of the way first. It is incredible and the idea of a contactless scanner is perfect of the things I need to scan on any given day. Here is a video that will quickly walk you through the features. This video does a great job of showing all of the cool things the scanner can do for a teacher. I love the end of the video where the student brings up their work, presses the button, and it is scanned right away. As an English teacher, scanning pages of books on a copier is a huge headache. I can't take the book apart for individual pages either. The SV600 is the perfect solution for scanning pages in a book. I can now scan pages, upload the PDFs to my Smart Notebook or Smart Amp file and have students annotate on the document. Another great use for the SV600 is archiving our old student news papers. We have papers dating back to World War II and it is too costly to have the pages scanned and saved by a company. With the SV600, students can carefully scan individual pages of the newspaper and we can now have archived editions of our school newspaper. Here is a collection of photos as I tried out the scanner with the newspapers. I loved having the scanner connected to my computer and my Smartboard so students could see the photo and note the high quality image that was scanned. The image of the scans were beautiful. We could zoom in on the scanned pages and we could see every letter and every picture clearly. It was an amazing picture. The scans can be saved as a PDF or a JPEG as well, so there are options as to how we choose to share these items. As an Evernote guy, I love that scans can be sent directly to Evernote. If there are pages of a document I want students to annotate, I can scan them and share them directly into a folder that the students have access. It is a simple way to get my students work. Once it is scanned once, I no longer have to worry about scanning them again. It will save me time in the long run when I scan the work. Auto crop several documents in one scan. If you are scanning a bunch of business cards, it will recognize this and crop out just the cards. Up to 10 documents can be in one scan. Page turning detection. It knows when you turn the page and will start scanning. This is just cool. The extra button pushes are removed with this feature and it works great! Fingers are erased. You can easily edit out your finger if it made it into the scan holding a page down. This is a nice feature for those who do not want their pudgy fingers not the page. Items can be scanned to Google Docs, to Microsoft Word, Dropbox, and other Cloud Storage services. The ScanSnap SV600 is priced at $795.00. When I was given the quote to archive all of our student newspapers, it was a few thousand dollars. With the ScanSnap SV600, I can do all of the scanning myself and whatever I want to scan for years to come. Overall, the ScanSnap SV600 is a beautifully designed scanner with high quality pictures that is very easy to use. The scanner would be perfect in the library for students and teachers to use who need to scan parts of books or their projects. The ability to share easily with Google and Evernote is a huge plus for me and I see this Scanner getting hours of use the rest of this year. The ScanSnap SV600 is an archivist dream and librarian's best friend. I was sent a ScanSnap SV600 for the purpose of this review. All content and opinions expressed are my own. Below you will find another excellent example of why project based learning is a wonderful part of the classroom. I asked my students to create their own Myth or Legend at the end of our Myth and Legend Unit. They could write a story, create a comic, make a movie, or offer an alternative. Most student chose to write the story, but these two students wanted to go all out and film their very own legend. There are some areas of grammar that could be worked on for this short film, but the overall idea was great. The students in class loved it and it started great conversations about Myths and Legends in each class I showed it. These two students worked hard in class and put in hours after school to add the sound effects and to just edit the entire piece together. I've written this before, but I'll write it again. What type of bubble test could inspire these students to work or accurately asses what they accomplished? 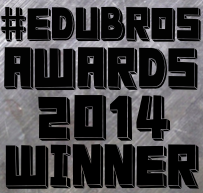 The #EduBroAwards are back and better than ever! Please take this brief pause to collect yourself and keep reading. Good. Now that you are slightly more calm and tad bit more collected, I will go over the fine details of how the #EduBroAwards work and why they have come back. The #EduBroAwards show was conceived as a way for people to celebrate one another after a long year of working hard, sharing, caring and generally being awesome. There are too many awards shows that focus on the few when we should all be celebrating the many. That is what makes our awards show so special and different from all of the rest. We want everyone to be recognized for how truly awesome they are. We have unlimited awards to give out and we can't wait to see the craziness that ensues when we hold out live Google Hangout to hand out the awards. The Awards Ceremony is tentatively scheduled for Thursday December 18 at 8:30PM EST. You can create your own award and nominate anyone you want. You can create your own award and nominate yourself. Someone can be nominated for more than one award. Here is a list of the award categories we have created. All nominations must be made in the comment box. You must nominate yourself for one of the awards created or one you have created. Nominations end Wednesday December 10th. Nick and Tim will host the awards. Every award will be presented live on the show. If you were nominated, you get to hear your name read out by Nick or Tim. Badges will be available after the ceremony is over. The show will be funny. Casual attire is encouraged, but formal attire would be way funnier. The last thing we want to say before you start filling the comments with nominations is that this is supposed to be a fun event. We love our friends and we want to recognize them in a way that is not a competition focused on self promotion or popularity. 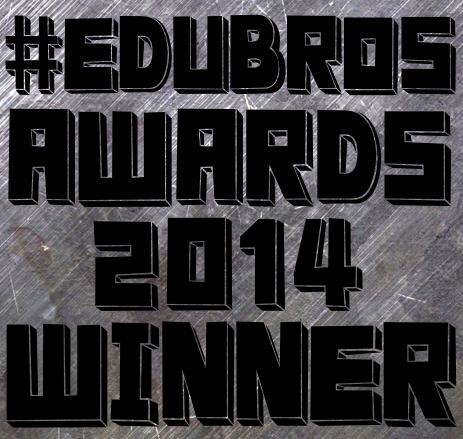 We want to do something fun and the #EduBroAwards are just the thing to put a smile on people's faces. We have a unique co-teaching and blended learning model at the NC Virtual Public School. Our co-teaching and blended learning model pairs an Exceptional Children's classroom teacher with an online content teacher. The students work within the online course and the classroom environment, giving students both a classroom teacher and an online teacher who collaboratively plan with a focus on each individual student. We will share the benefits found in our model along with details about its beginning, implementation, and next steps. Jen Currin is the Instructional Director for Credit Recovery, English, and Science at NCVPS. Jen has been with NCVPS since 2010 and has served as an online and blended learning teacher, Instructional Leader, course revisionist, and course development team lead. Jen was the 2013 NCVPS Teacher of the Year and a finalist for the 2013 National Online Teacher of the Year. Sherry Bell joined NCVPS in March 2012 and is the RttT STEM Project Manager and Director of the Blended Occupational Course of Study Courses/Exceptional Children/504 Programs. She is responsible for quality assurance in the online learning courses in order to support the learning of exceptional children taking NCVPS courses and in accordance with the virtual STEM model outlined in the Race to the Top grant. Mrs. Bell holds a Bachelor of Arts in Communication Disorders and a Master of Arts in Speech Language Pathology, both from Appalachian State University and has a license in Exceptional Children’sProgram Administration K-12. While some data can be very unappealing, the right tools and support can increase your staff and students’ awareness and engagement, allowing you to fully utilize your resources and maximize end-user adoption of your LMS. Learn how Lawrence Public Schools maximizes personalized learning for students and staff in a data rich environment by utilizing a learning management system (Blackboard) complemented by adoption-success software. Angelique Kobler leads a team of education administrators for Lawrence Public Schools. As the Assistant Superintendent for Teaching and Learning, she partners with dynamic educators who are leading the way in innovative classroom practices. She shares her passion for disrupting the status quo via social media. You can reach her at akobler@usd497.org or through Linkedin. Terry McEwen currently the Director of Assessment, Research, and Instructional Resources for the Lawrence (KS) Public Schools. He has been in the district office in the Lawrence Public Schools for the past 12 years. Previous to his tenure in Lawrence, he was a senior high school Instrumental Music teacher and then a senior high school English/Language Arts teacher in west-metro Denver for 25 years. He chaired of a 20-teacher English Department in a high school of 2200 students in Jefferson County Public Schools. In his teaching life, he has literally taught Kindergarten students through seniors in high school - and every grade in-between. Terry completed his Ph.D. in Educational Leadership and Policy Studies at the University of Kansas, which led him to his current position in the Lawrence, Kansas School District. His doctoral research focused on the curriculum design of mathematics and resultant student outcomes.He also serves as an adjunct professor of education at Baker University School for Professional and Graduate Studies in Overland Park, Kansas; and an adjunct professor of graduate studies in education at Fort Hays State University in Hays, Kansas. This is really a letter of apology to all of the classes that get the first run through of a lesson. Today is just another example of how teachers change on the fly to make lessons better as the day go, but I feel bad for my first hour. Today, I had my students use TodaysMeet as their exit ticket. They needed to re-write a good topic sentence based on an old topic from earlier in the year. My thinking, which was terrible, was that I would give them a thesis I wrote based on a question they encountered earlier in the year. Even explaining it is complicated. Students seemed confused and had a hard time coming up with a new topic sentence because they did not write the thesis. Ugh. It was a mess, but my students did the best and completed the task. As the disaster was unfolding, I realized that I would have my 6th hour just rewrite one of their claims from the essay in front of them. It was so simple, I should have just gone with that in the first place. I managed to talk myself out of it and I'm not sure why. The good part is that I'm reflecting as I teach and making changes as they are needed. However, what about my first hour? Are they forever doomed to get the "not as good" lesson? I really wish I had a rotating schedule here so the I would see different classes at different hours so the first hour would always change. Anyone have any thoughts on dealing with the first lesson of the day mess-ups? Here are some thoughts on student projects and teacher evaluations. I've thought about instructional goals for the evaluation process, but I have never really thought about Leadership goals. I wonder how many teachers have approached it the same way I have over the years. Here are my thoughts on the week. Feel free to leave a comment and let me know what you are thinking. I've written about Swivl on my site before here and here, but here is a great post on a how a new teacher has used it in her classroom to accommodate a student who misses school due to illness. This is a great reason to consider Swivl for your classroom. My name is Katie Parent and I’m an English teacher in Michigan. I’m writing today about Swivl, a piece of technology that I recently tried in my classroom. I have an honors student who is chronically ill and is hospitalized for treatment one out of every five weeks—we’ll call her Rebecca. Rebecca is a star student, always putting forth 100% effort and contributing to class discussion; school is a positive place where she can excel. As you can imagine, having a debilitating illness can get in the way of this. Rebecca’s mother contacted me before her first hospitalization this school year, wondering if I would be comfortable recording my classes so that her daughter can watch them while she is receiving treatment. I was eager to do so, but faced one issue: I am very mobile in my room, hardly staying in one spot for more than a few seconds. How would I be able to record myself as I moved around the room? Enter: Swivl. A couple of coworkers threw out the idea of utilizing Swivl. It’s a “robotic mobile accessory, app, and cloud service” that tracks the subject as he or she moves freely about a space (swivl.com). As long as the subject holds or wears a small infrared sensor (about the size of a lighter), the Swivl docking station will pivot and tilt to track the subject. The dock fits iPhones, iPads, and Android devices. I was initially concerned about recording the hour-long class on my iPhone, as I have minimal memory remaining. Fortunately, Swivl has an app that uploads the recording directly to the Swivl Cloud, saving you precious space on your device. Setting up the Swivl was seamless. It was delivered to my room 2nd hour, and by 3rd hour I had it up and running, recording my lesson. Students were fascinated with the device and were eager to learn about how it works. I placed the Swivl on a file cabinet in the back of my room, where it would minimally distract students. The gears and motors in the Swivl are so silent that the students didn’t even hear the device pivoting and tilting throughout the lesson. There were times where the device took a couple of seconds to sync with the sensor, but overall, it tracked me rather well. One hiccup was that my phone locks every five minutes, which meant that the recording stopped every five minutes. This was quickly fixed by changing the lock settings on my phone so that the lesson would be recorded in one take. However, it would be nice if the app could do that automatically. This product has been a huge help to my classroom. Rebecca was able to stay on track, despite missing five consecutive days. I didn’t have to explain anything to her once she returned because she saw it all firsthand. I plan on using Swivl for every treatment week or any lesson that I would like to have a recording. Swivl has helped me accommodate a student in need and will prove to be an asset, especially when working with students who have extenuating circumstances. You are ready to blend, now what? Join me for a discussion on how to move your elementary classroom from direct instruction to a blended learning environment. I am a seasoned teacher with 32 years of experience teaching first and second grade. I began my journey with Blended Learning one year ago and watched as my students transformed into totally engaged, collaborative, self-directed learners. 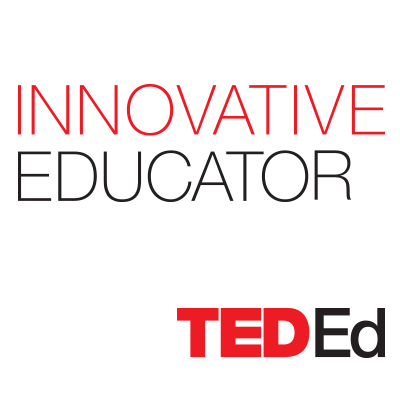 I’m excited to share about my most effective year as an educator. Here are some thoughts on Week 10 of teaching. Check out some of my other reflections on the #NerdyCast channel. I went to my sessions early yesterday and I had some time to kill as people were filing in. I thought it would be fun to play a video of the greatest cartoon theme songs of all time. This was just a silly way to start the session and the people were smiling and singing along. I was able to engage in conversation with the audience and start off with a positive energy in the session. I was thinking about this after the day was over and wondered what inspired me to do it. I realized I do things like this in my classroom. I love starting class off with random songs or videos. The kids get a little goofy and we have conversations about whatever is being played. It starts the class off with a positive note and the kids have the high energy. It is important to remember to bring the fun and silly into class. Students are moving from class to class and they are just beaten down sometimes. Changing the pace and letting them have a little fun to start the class can really have a positive impact on class. The next time you feel the energy dropping in class, just stop and have a little fun and watch the class come back together.